Honey Garlic Ribs are a standard on almost every westernized Chinese restaurant menu. There are endless permutations on the theme but the basic requirements are that they be garlicky and sweet, with the sweetness almost invariably coming from sugar rather than actual honey. Indeed, I have made versions using honey several times and the result is just not the same at all. Here you can see the bits of rib I am using. I purchased a huge rack of ribs on special (it must have been nearly half a rib-cage) and I butchered it myself to yield two packages each of nice long rib sections, some strips of ‘spare-rib’ and the trimmings, or riblets, pictured above. 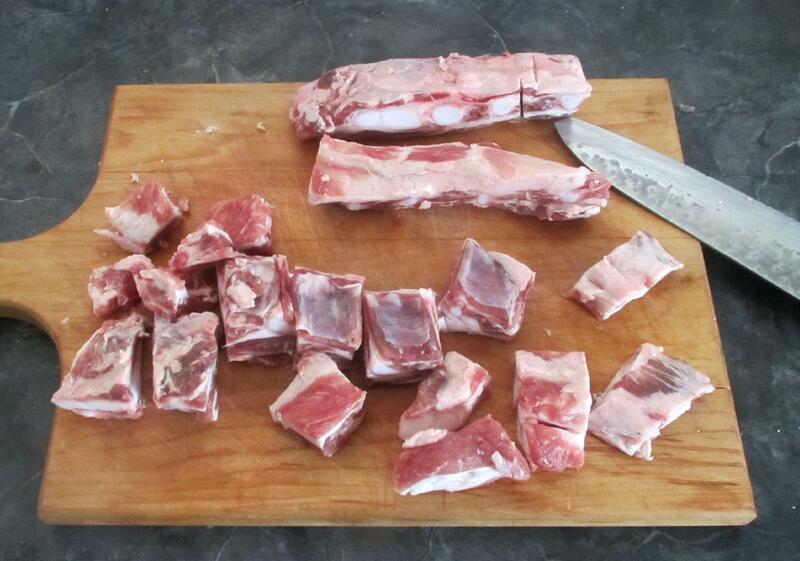 This represents about half the yield of riblets and I have already trimmed away some of the excess fat. ½ cup finely sliced Onion. Once you have cut your ‘ribs’ into small chunks, toss them with the pepper and 1 tablespoon of the garlic paste and let them marinate for a few hours or overnight. 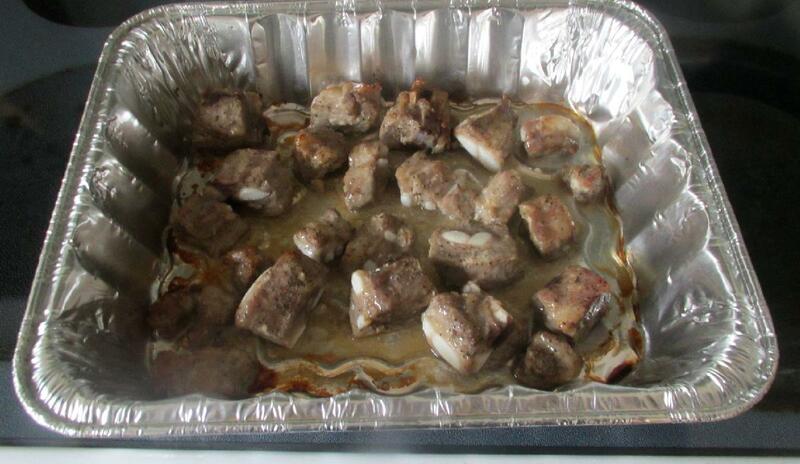 Next, place the ribs in a baking pan and bake them in a 350 degree oven for about thirty minutes or so until browned. If you were using lean back or spare ribs, you could quickly brown in a pan or deep-fryer but the object here is to get the lesser cuts to throw off as much fat as possible. 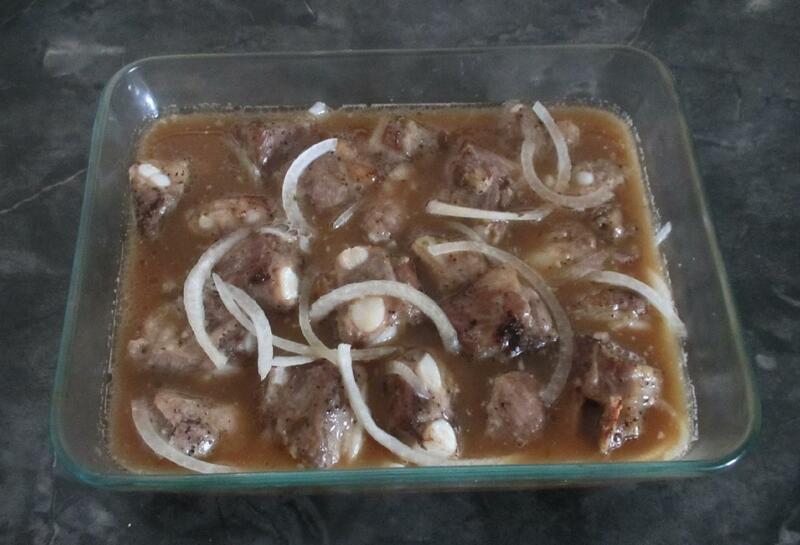 Drain the fat from the ribs then toss them with the onions in a suitable baking dish. 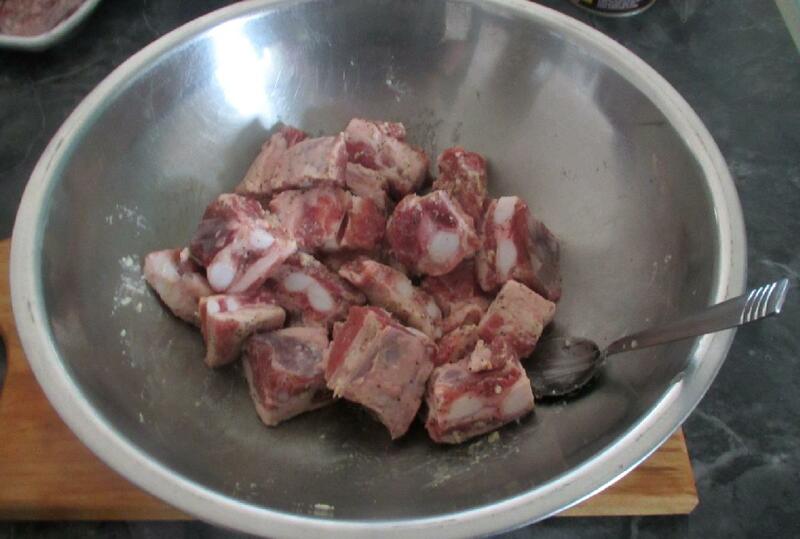 Then mix together the stock, sugar, vinegar, soy and remaining garlic paste and pour it over. Finally, ake the ribs in a 375 degree oven for 45 – 60 minutes until the meat is tender and the sauce nicely bubbling. 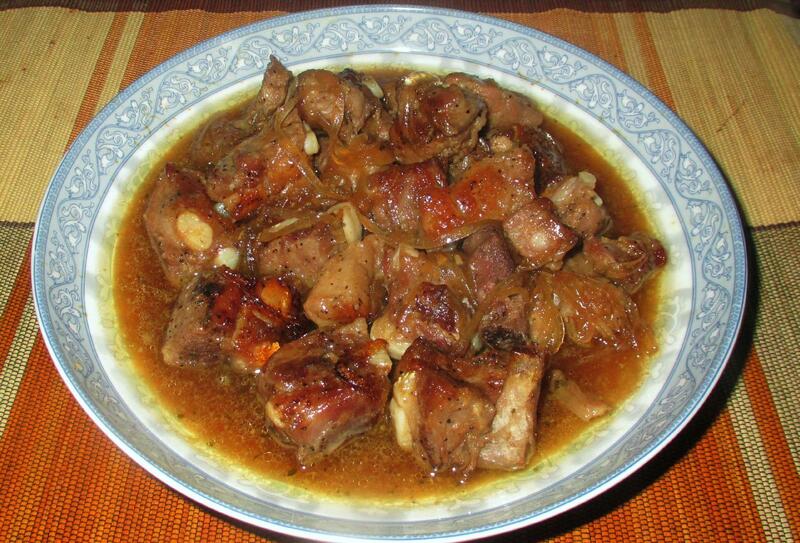 With some versions, the idea is to reduce the sauce to a glaze but here the result is more like the Honey-Garlic Ribs you often find on Chinese Restaurant Buffets… that is, small ribs in a fairly thin sauce that can be spooned over rice. That’s all there is to it …. Sounds good. Love the amount of sauce; so good to spoon over the rice I’d eat with this dish. I’d definitely follow your suggestion to cut the sugar–I prefer a hint of sweetness to a rib candy. Question regarding garlic paste: can I get the same effect by running garlic cloves through a press, or is there more to garlic paste than that? Oh sure … the garlic paste I am using was just a convenience. I tend to keep a jar on hand for when I am out of garlic or my cloves have got a bit old. I find the commercially made minced garlic in a jar gets a bit of an oily taste where the paste is much nicer. Finely chopping garlic or using a press would be just fine,,, I’d be inclined to use a little more in those cases though as the paste is quite concentrated.